Varnishes are applied over a completed piece of work to change or unify the surface sheen and protect the painted surface from the environment and ultraviolet light. Liquitex varnishes are either permanent or removable and can be applied to both flexible and rigid supports. 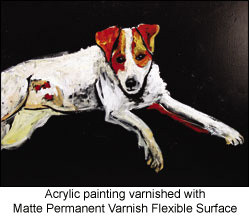 Extremely clear, permanent varnish for acrylic paintings on flexible and rigid surfaces. Greater clarity in the wet state than many acrylic varnishes. Fluid viscosity with excellent levelling properties for brush stroke free application. Permanent and durable for superior protection against the environment. Apply with a clean, flat, tightly packed varnishing brush or paint pad. Do not brush vigorously over textured surface to avoid bubbles. Do not brush back into areas while varnish is drying. Do not overlap into partially dried areas. Apply one or more additional coats after each coat is thoroughly dry to the touch. Do not shake the bottle prior to use. Varnish surface and environment must be clean, dry, and dust free. Application may be done by brush or spray. Generally a sprayed application will be thinner, smoother, and more even. Rolling or sponging application is not recommended. Thinning is not recommended for Gloss Varnish, however a small amount of Flow-Aid may be added to increase flow and penetration. Caution: Acrylic paints and mediums become increasingly brittle in cold weather. Do not apply below 60 oF. Use a wide, soft hair brush or paint pad (vacuum the pad prior to use to remove lint). Size of area to be varnished will determine the size of the applicator. The smaller the surface area, the narrower the brush. Generally, a 1-4" flat brush is used. Do not rework areas you might miss as the brush could pick up partially dried varnish and cause clouding. If areas are missed, wait until the varnish is dry and apply another coat. When applying Liquitex Matte Varnish or Satin Varnish, apply no more than 1-2 thin coats. A thick application may result in cloudiness when dry. If more than 2 coats are desired, first varnish with Gloss Varnish until desired thickness is achieved, then final varnish with matte or satin varnish. During spray application. maintain same distance across the surface of the artwork. Move your body as well as your arm to avoid "arching" motion and uneven application. During spray application maintain same distance across the surface of the artwork. Move your body as well as your arm to avoid "arching" motion and uneven application. Thin, if desired, with a small amount of water to allow the varnish to flow easily from the brush or airbrush. Thin with small amount of Flow-AidTM/water to reduce brush marks or spray apply. Refer to Liquitex Paint Additives: Flow-AidTM Flow Enhancer. Archival Removable Varnish for Acrylic and Oil Painings. Contains UV Light Stabilizers for protecting colour. Apply as a final varnish over dry acrylic or oil paint. 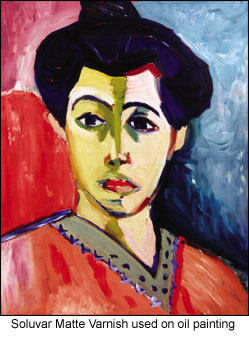 Lowers intensity and depth of colour, while reducing the surface glare. Also available in Gloss which may be intermixed for a variety of sheens. Permanent, removable, final varnish for acrylic and oil paintings that protects painting surface and allows for removal of surface dirt, without damaging painting underneath. Once surface is clean, a new coat of Soluvar® may be reapplied to surface. Thin with mineral spirits or turpentine. Do not use Odorless Mineral Spirits. Dries to a clear, non-tacky, water resistant, hard film that is resistant to retention of dirt and prevents dirt and pollutants from contacting paint surface. Self-leveling. Will not hold brush strokes. Flexible. Will not crack as surface expands and contracts during temperature and humidity changes. Painting surface and environment must be clean, dry and dust free. Allow oil paint to dry for 6 months to one year and acrylic paint for at least 72 hours. Thickness of application will determine exact length of time. If an oil painting is not dry before it is sealed with a varnish, the result may be long-term problems such as cracking or blistering. 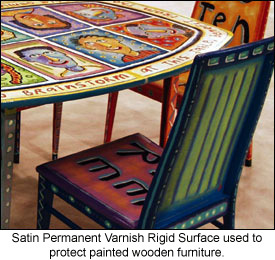 Varnish may become non-removable if applied over a painting that has not completely dried and cured. Intermix Gloss and Matte Soluvar Varnish for a variety of sheens. 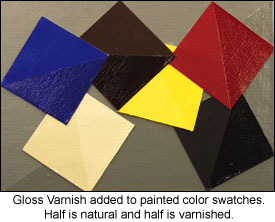 Soluvar Matte Varnish contains matting agents that settle during storage. Gently stir with brush handle or dowel until completely re-dissolved. Do not shake. Apply 1-2 thin layers of Soluvar Varnish. Let each layer dry 24 hours between coats. Allow acrylic paintings to dry a minimum of 72 hours or longer if paint is very thick. Apply 1-2 coats of Gloss Varnish as an isolation barrier. The barrier coat physically separates the painting from the Soluvar Varnish and seals the surface. This aids in a more even application of Soluvar Varnish and protects the painting if the Soluvar Varnish needs to be removed. Allow to dry for 3 days. To insure proper adhesion, surface must be cleaned with lint free rag slightly dampened with mineral spirits. Apply 1-2 layers of Soluvar Varnish. Let dry 24 hours between coats. Horizontal surface application is best with less chance of varnish running. After varnishing, the surface should be shielded with a protective "tent". This will prevent any dust or air borne particles from settling into varnish as it dries. Good ventilation and a carbon dual filter mask are important. Thin with up to 25% mineral spirits or turpentine. Do not use Odorless Mineral Spirits. Remove varnish in clean, well-ventilated area. Wear a dual filter respirator (NIOSH approved) and neoprene gloves. Dampen a small piece of lint free, soft, white cloth with mineral spirits (not "odorless") or turpentine - nothing stronger. Do not use ketones or paint removers. Work horizontally. Apply mineral spirits generously and allow it to lay on surface for 15-30 minutes. Check periodically. Longer time may be necessary, depending upon age of artwork and strength of mineral spirits. If varnish is not dissolving or dissolving slowly, use a higher strength mineral spirits or turpentine (cover with plastic to slow down evaporation of mineral spirits). Stronger mineral spirits are not labeled as such, but have a stronger odor. Rub cloth gently over a small area 1-2 square inches until varnish starts to dissolve. Using a clean cloth and clean solvent, rub the area again to remove residue. Repeat this procedure for the entire area to be cleaned. If any paint colour shows on the cloth, stop immediately and allow the surface to dry. Allow painting to dry before reapplying a fresh coat of Soluvar Final Picture Varnish.